As I have mentioned before, my little man gets very irritable when we spend a lot of time inside the house. As spring is arriving here in NC, Tommy and I have enjoyed spending more time outdoors. We are lucky to live very close to a beautiful lake with walking trails all around. Nature walks are our very favorite activity to do together and are our guaranteed way to turn around a bad mood… his or mine! It is amazing how a little fresh air and wide open space can instantly relieve stress and calm restlessness. Last week, I decided to try something new during our walk. I usually have a goal in mind- make it to the park by 10, or finish walking the 2 mile loop by lunchtime… but this time we slowed down and stopped a lot along the way. We started our walk early so that we would have lots of time to let T explore at his own pace. (We even had time to meet up with some friends to play along the way, and then continued our walk after they left.) I had made a quick note before we left of a few things I wanted to point out to him along the way so that we could work on expanding his vocabulary. 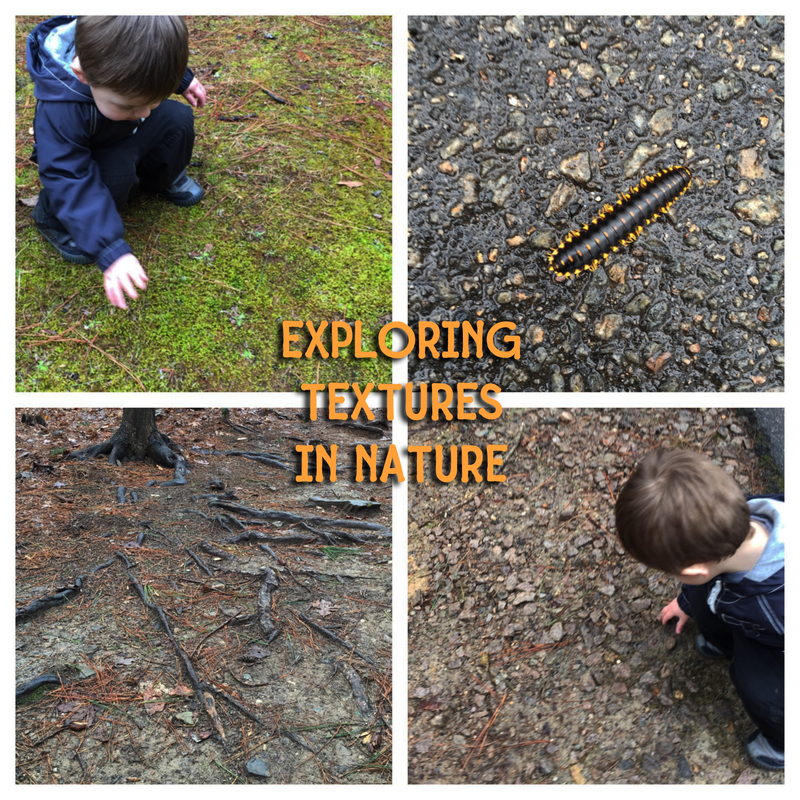 Some things we looked for: leaf, rock, stick, pinecone, lake, tree, path, roots, moss, bug, creek, log, squirrel. I let him out of the stroller and let him stop to touch or pick up things along the way that seemed interesting to him. (I supervised closely to make sure he didn’t get his hands on anything dangerous or disgusting.) Then we paused for a moment and talked a little bit about what he had found– what it was called, how it felt, what color it was, etc., and I snapped a quick picture to document what he had found. When I saw one of the items that I had on my list, I pointed it out to him and we talked about it. We continued to do this as we walked, and when he got tired and wanted to ride in the stroller, I made sure to point out things that we saw along the way and describe them to him. “Look at the tall green trees. There’s a big lake full of water. Do you feel the cool breeze? Do you see the bright yellow sun in the blue sky? There’s a dog running. Do you hear what the dog says? Woof!” I like to use a lot of descriptive words when I talk to him to familiarize him with the different ways to describe an object and to use his senses to learn about the world around him. 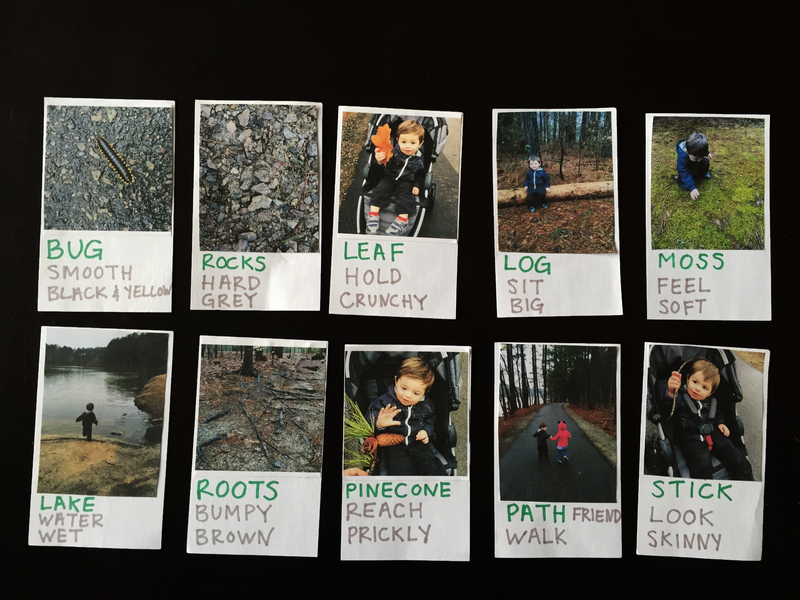 This was a great way to work on expanding his vocabulary with nouns, verbs, and adjectives describing the things that we see in nature in the area where we live. To have a way to practice these new words while we are indoors, I decided to make some simple flashcards. Go on a nature walk, talk about the items you see along the way, and take some pictures. Print some of the pictures. Cut out the pictures and glue each one onto an index card. Below each picture, write three words: a noun telling what it is a picture of and two words describing the object or what is happening in the picture. When Daddy got home in the evening, T was so excited to show him his new flashcards and pointed out the pictures of the things that he saw, and even used a few new words that he had learned! We can now refer back to the cards to practice our nature words any time. 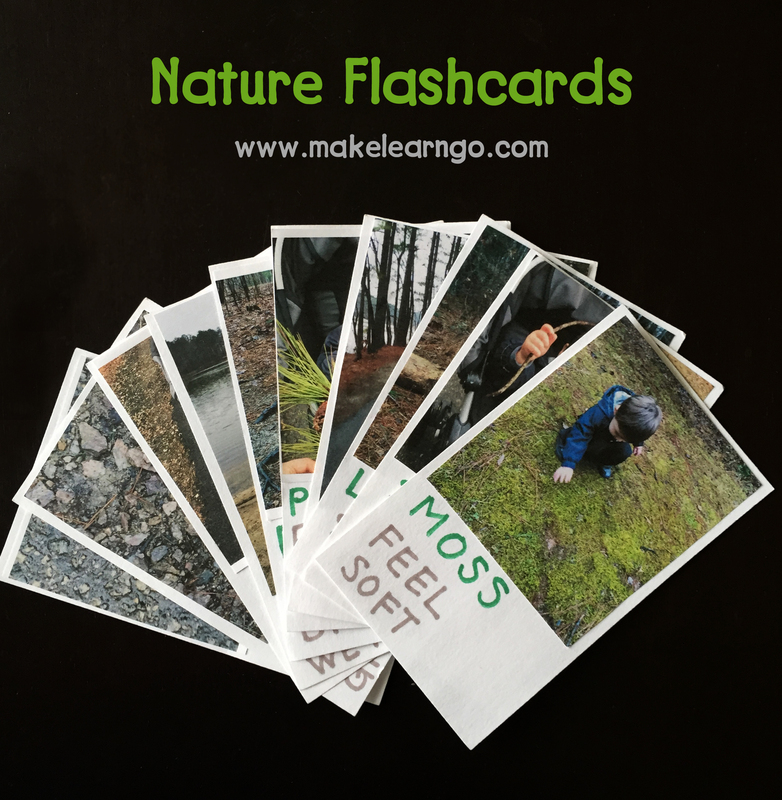 I plan to take more pictures as we go on more walks this spring and make new flashcards as we see and learn about new things. Now it’s your turn! 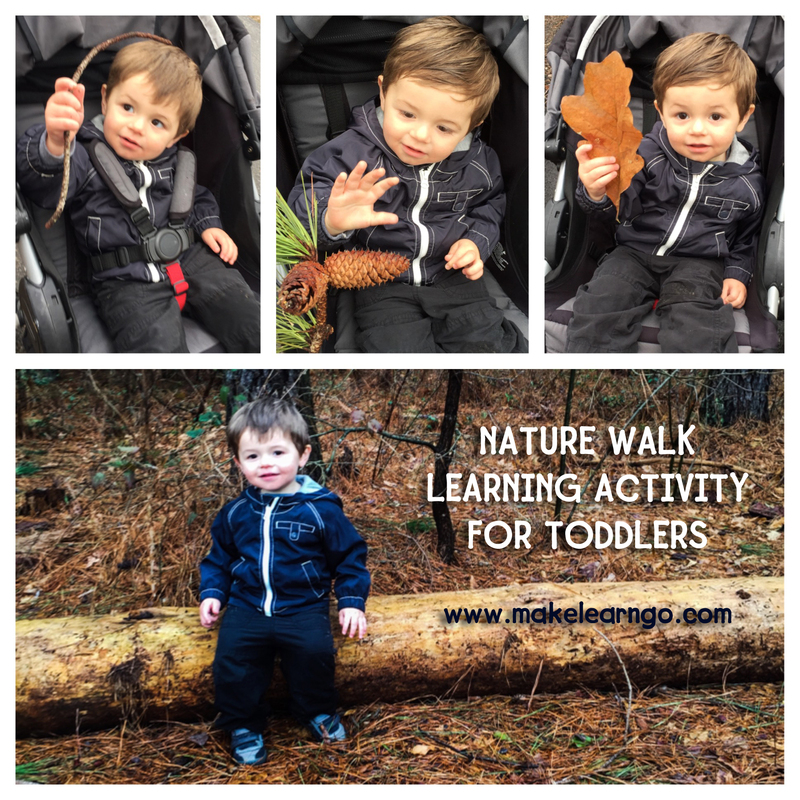 Take your little one out on a nature walk and tell us about what you learned. Ready? Make, learn, go!